When a truck plowed into a crowd celebrating Bastille Day in Nice, France earlier this month, it was another painful reminder that a criminal or terrorist attack can happen at any point. Although we should live our lives as normally as possible, it’s important that each of us is prepared to take personal safety measures if an incident occurs. Whenever you go to a public place — like a movie theater, shopping mall, restaurant, or sports arena — take the time to identify the closest two exits. It’s important to find a second exit in case your first option is cut off. If you can sit closer to an exit (like in a movie theater), take the opportunity to do so. If you’re out at a restaurant, take note of the kitchen’s location since there’s usually an exit route nearby. Some stores in shopping malls will have storage areas that will also provide back-door exits. Avoid looking down at your phone while you’re walking; instead, swivel your head from side to side so you see everything around you. You don’t need to be on high alert at all times, but getting into a routine of constantly taking in your surroundings will let you quickly identify something that’s amiss. How should you respond if an active shooter is in your area? The Department of Homeland Security recommends following the “run, hide, fight” approach. That means first trying to evacuate. If you’re unsure where the shooter is, it’s important to not run around blindly. Pick an escape route and stick to it. There will be a commotion as the large crowd of people all tries to escape the area at the same time. Try to stay as low to the ground as possible, but be sure to have full control of your balance to avoid falling. Don’t bring any belongings with you as that may slow you down. Keep your hands visible at all times. If running is not an option, then hide in an area outside the shooter’s line of sight, DHS recommends. If possible, block entry to the location and lock the doors. Silence all cell phones. In a restaurant, you may need to drop to the ground immediately and use your table as a cover. If you’re in a public office, then close and lock your doors and turn off the lights. Take action against the shooter only as a very last resort. The Department of Homeland Security recommends throwing items and the shooter or trying to incapacitate the person in some other way. This should be seen as a last possible option — only when your life is danger, and evacuation and hiding options have been exhausted. Even if you’re not in the immediate location where a criminal or terrorist act occurs, the Red Cross recommends taking steps to ensure your safety. Turn on the radio or TV to hear news and instructions, and follow the advice of local responders and public officials. Smell for any gas leaks. If you suspect there is one, turn off the valve right away, open all windows, and leave the building. Don’t light any matches or turn on light switches; instead, use your phone or a flashlight to check for damages to utilities and wiring. Be on the lookout for fires or fire hazards. Make sure your family has an emergency plan. Practice it often so you’re ready to act if an incident does occur. Urban Alarm has launched a sister brand in Vermont. For more information please visit the website of Green Mountain Alarm. Of the more than 30,000 security cameras in Washington, D.C., many are analog cameras installed using older wiring. These cameras are no longer meeting the high-resolution image demands of 2016. If you have a security system that relies on analog coaxial cable wiring, what's the best path forward? Use a converter. Converters (like this one from Network Video Technologies) allow you to run IP (Internet protocol) over COAX and/or two conductor wires. - Use higher resolution cameras with 3-5x the resolution of analog HD cameras. - Zoom in on important information, without losing clarity. - Rely on a single cable for data and power for multiple cameras. The downside? The converter may be more expensive than the actual camera significantly increasing the per-camera costs. Add HD analog and phase in IP cameras. Keep your COAX cable and hook it up with HD resolution analog cameras. Over time, you can expand it to include IP cameras, as well. - Offer good image quality. - Have minimal configuration requirements compared to IP cameras. - Can transmit video up to 1600' exceeding most network wire distances. - Work off network, so they won't take up bandwidth or clash with others resources. While HD analog cameras have recently been around half the cost of IP cameras, that difference is closing and and some IP cameras are more or less the same cost. Start off with HD analog cameras right away, and work in new IP cameras over time. A new security camera rebate program is making it easier for D.C. residents to buy and install private security cameras. Residents, businesses, and religious organizations in several D.C. wards can now apply for rebates to purchase and install security cameras on their buildings, as a part of the government’s Private Security Camera Incentive Program. The D.C. camera initiative will allow some owners and tenants to receive up to $200 per individual camera (there is a cap of $500 total per residence or $750 for commercial properties). Offering security camera rebates is “another step to deter crime and assist police during investigations,” said Mayor Muriel Bowser in a statement. Police will be able to request video footage from camera owners to investigate crimes, but will not have access to live video feeds, the mayor’s office said. In addition to capturing crime as it happens, the mere presence of video surveillance can deter intrusion altogether. Some systems also work like a motion detector to alert owners when something may be amiss. Applicants can identify their property’s PSA online. Only those in the priority PSAs can apply for now, but it will be opened up to anyone after August 1 — provided the program’s $500,000 budget has funding remaining. Security cameras must be installed on the exterior of the building and need to meet minimum requirements — including 250 GB of storage for digital cameras (125 GB for analog) and 1280x720 screen resolution (640x480 for analog). The security cameras must have been purchased and set up after September 22, 2015. The property owner must also register the cameras with the Metropolitan Police Department in order to qualify for the rebate. After the application is approved, it make take up to 45 days to process and send the rebate to the applicant. In response to their reporting CERT (Computer Emergency Response Teams, sponsored by the US Department of Homeland Security) issued a “Vulnerability Note” echoing this warning. This is not news. The majority of consumer intrusion alarm manufacturers operate under the assumption that intruders are not going to be knowledgeable or do their homework. And they are largely correct. Most break-ins are opportunistic and perpetrated by someone looking for the easy way in, and a quick way out. Intrusion Alarm Systems do not need to be sophisticated to address this threat. The wireless vulnerability is just one of many deficiencies of most security alarm systems. most of the EQUIPMENT installed by national alarm companies have been found to be vulnerable. Urban Alarm installs alarm control panels that are not SUSCEPTIBLE to these issues. Basic encryption, standard in any consumer WiFi router, is extremely rare and generally only implemented in the most secure DOD level intrusion alarm systems (e.g., Sensitive Compartmented Information Facility or SCIF’s). I have never heard a major consumer-oriented alarm company mention issues around social engineering much less have a strategy for mitigating those risks. Well, yes and no. It is shockingly true that systems sold by most security alarm manufacturers are vulnerable to this same problem. However, there are security alarm systems that are proactive in addressing these issues, and much less vulnerable. Security alarm installers that put security ahead of cost and some “nice to have” features can talk about these trade-offs, and offer options that significantly address these problems. I recently discussed “high security alarm systems” with a customer who was looking for the absolute state of the art in security. And while most major alarm companies would suggest such systems center around “smart homes” and “internet of things” the most secure systems are not always the coolest systems (or at least the systems that look cool in an advertisement). What makes a high security intrusion alarm system? There is a range, from the DIY and mass market systems covered in these Wired articles, to the uber high security systems that are defined by UL standards and are the cornerstone of security for the intelligence and defense agencies. Most of the systems Urban Alarm installs address the specific wireless vulnerabilities covered in the articles with two-way wireless, wireless jamming detection, higher frequency spread-spectrum technology, and variable time duration supervision. Some customers want the alarm system to sound a warning when interference jams the wireless signal for a moment. Others are less concerned and would prefer an uninterrupted night’s sleep to a false warning from innocuous stray wireless signals. It is not practical or cost effective to implement all of these strategies in every installation. Threat assessments are a part of designing a good security alarm systems. Installing a security system where there is a specific targeted threat may be different than for someone whose primary concern is the most likely scenario: the 99% opportunistic threat. The security industry needs to do better. The near industry-wide “security through obscurity” model is going to get worse as naive mass market providers try to compete with creative feature innovation coming from Silicon Valley and manufacturers (the good ones) are pushed beyond their focus on pure security. Enterprise physical security has technology advances every year but it is most often only loosely connected, and often falling behind, the innovation coming out of Silicon Valley. The lagging innovation coming out of the historically slow moving enterprise security and commercial life safety industries is increasingly making those companies vulnerable to the creativity and disruption coming from the Maker culture of new technology. We deploy many newer products and services in the operations of Urban Alarm. Slack (www.slack.com) has become a primary platform for our internal communications around projects and operations. Between Slack for real-time communication and Asana (www.asana.com) for task based collaboration we have all but eliminated internal email. One of the promises of new technologies like Slack and Asana is the open integration which is leveraged to an extreme with integration focused services like If This Then That (IFTTT) and Zapier. This integration can be a quick and simple opportunity to integrate physical security technologies with a modern workflow. 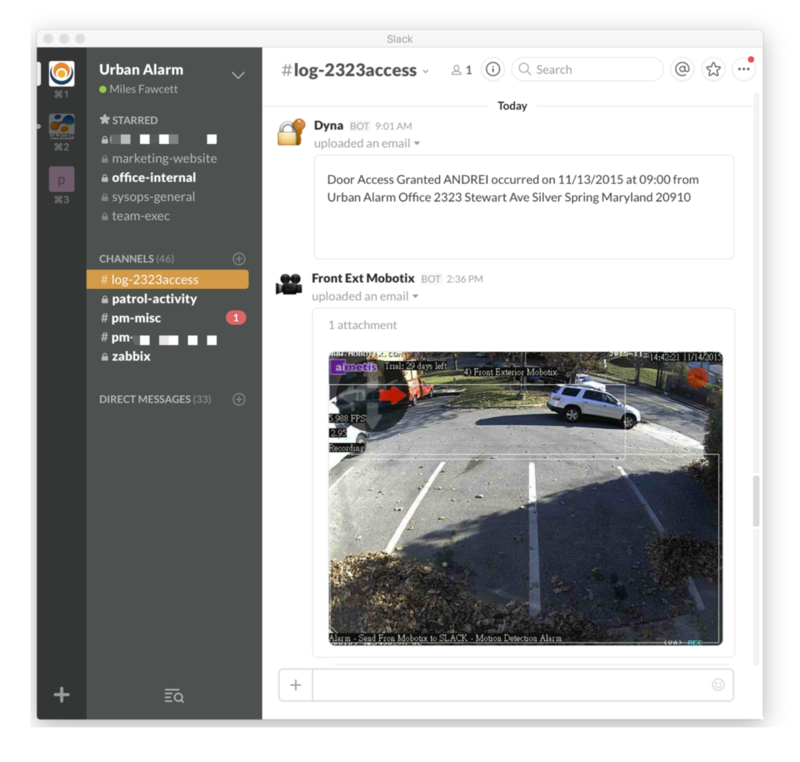 For our offices we have created a Slack channel where door access control and video security alerts feed in via email or direct IP integrations. Email based integration is quick and simple however the feed can be better customized with webhooks or a more direct API. Send video from off-hours access to Asana or another task management system so operations to "check" all accesses as valid. Track all alarm system arming and disarming of the alarm system in a slack channel. Send all video events (or some subset of video events) into Slack, Asana, and any other system that fits your organization's workflow. The Zapier Integration Zapbook is a good place to start for ideas even if you don't end up using Zapier to accomplish the integration. Modern cloud based web services almost always have excellent options for integration using email, WebHooks, or other methods. Vacant properties are a major contributor to community safety and security. The recent discussion around fixing DC's Vacant Property Laws is an excellent step. Missing from 4D-04 ANC Commissioner David Sheon’s report is a requirement to secure the property to avoid unwelcome occupants and nefarious activity. No neighbor should have to live next door to a property that is open to use for illicit activity at any time of day or night. This should be a priority to protect neighboring residents while the property is vacant and in the early stages of construction where crews are often not on site daily. Vacant properties and construction sites can be very effectively secured. Fencing is already a requirement as part of most building permit processes, but effective intrusion security should be specified as well. Security Alarm Systems installed and monitored by Urban Alarm on construction sites in DC have resulted in multiple arrests in 2015. We see these sites going from frequent regular issues to none once an effective system is deployed. Urban Alarm’s approach to these systems is motion activated surveillance with video verification. When an alarm is triggered, the dispatcher reviews a video clip to determine the cause of the alarm and takes appropriate action including dispatching the police. For more information on video verification and security alarm systems to secure vacant properties and construction sites. Thermal Video Cameras are the future of video surveillance… and its really cool! Video surveillance cameras have come a long way in their ability to show meaningful images in low light. Infrared lights are a common feature of every the lowest priced cameras. Low light cameras can show a reasonable image in extremely low light conditions. But none of these come close to the images from a thermal camera and their effectiveness in video surveillance and outdoor intrusion detection. The difference between a Carbon Monoxide (CO) detector and a Combustible Gas detector is not always clear but it is an important distriction for home safety. Commercial fire alarm systems are a necessary component of most commercial properties. Selecting a company and a system can be a challenge. One of Urban Alarm’s core values is that customers should be able to choose who they work with and not be locked into a single provider. If you are not happy with the vendor you should have the right to choose another. Working closely with DC-area fire and police response teams is something we do on a regular basis. And as with any great working relationship, it’s nice to converse outside of normal business hours. As a sponsor of MPD’s 2nd District Citizens Advisory Council Awards Benefit, this past October, we were honored to chat and dine with some of DC’s distinguished police officers.